Ready to make your first outfit? To get started you’ll need a doll to wear your outfit, scissors, tape, regular printer paper, and a printer. To begin with I would recommend making a top and circle skirt for your first outfit. The Printable Doll Clothes Sample Dress would be a great starter dress as it uses no color ink and has all the pieces you need on one page. You can print it and get started with these tutorial videos. Just pick the video with the doll you are you using or watch a video of a similar doll to the one you are using. 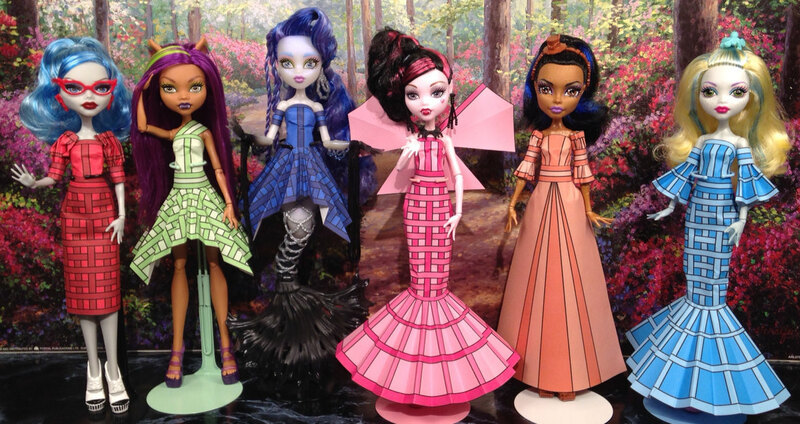 Its the same basic method to make the dresses no matter what size doll you use. If you print a color dress be sure to let the ink dry before cutting it out. Wet ink can make the paper curl funny and may possibly stain your doll. Also be careful not to get your doll’s hair caught in the tape. I have more detailed instructions further down but if you’d like to get started now just print your outfit, cut out the outside edge of the pieces, undress your doll, watch the tutorial, and make your first dress! There are a LOT of different combinations. To get ideas, you can browse around my “the dresses” section to find a dress you like. For each dress there is a list of the pieces I used to make the dress in the order to make them. Or you can visit the individual outfit piece pages for instructions on how to make the pieces. Have fun and enjoy mixing and matching the pieces to create new combinations and looks. Depending on which doll you are making a dress for there will be some variety in how the finished dress looks. 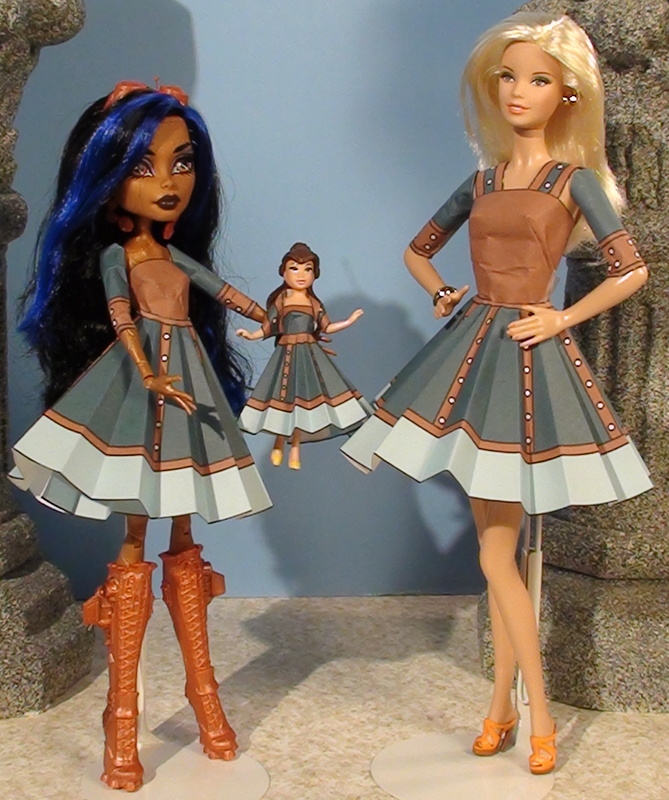 It is the same basic principal for making the doll dresses but a thinner and smaller doll will have more overlap while a thicker taller doll may need extra pieces. Really small dolls can use the small circle for a skirt instead of the larger circle. You’ll need to decide whether or not you okay with getting tape on your doll. For some of my play line dolls I don’t mind putting tape directly on the doll but I would not do this with a really special doll or one made of something other than plastic. A few of my pieces work better when taped directly to the doll but for a special doll I would put in a piece of paper for an insert between where I want the tape to go and a connecting point of the outfit or just not use that particular piece rather than risk the doll getting sticky. When taping try to keep the tape where it won’t be seen. Decide which angle you want to display the doll (I usually display them facing forwards) and make the outfit on the doll with this angle in mind, putting the tape where it won’t be seen. Also be sure to smooth the tape after placing, this keeps it in place better. Occasionally a piece of tape may come undone a couple of hours after the outfit is finished (I’ve had this happen with belts in particular) just add some more tape if this happens. Be careful with your dolls hair when taping, you don’t want her hair to get snagged in the tape. Turn her head around to the other side when you are taping or have some one hold her hair out of the way. If you balance the doll with her feet on your stomach, her hair falls downward and out of the way. Some of the pieces, especially the top, can be tricky and may take some practice so it’s good to practice with a black ink only template when you are learning a new piece. To save paper and ink you can just print the pages with the pieces you want to use. Before beginning, you’ll want to undress the doll except for the shoes she will be wearing. Some doll stands you can use while making the outfit, but if the stand gets in the way you’ll want to take the doll off the stand.